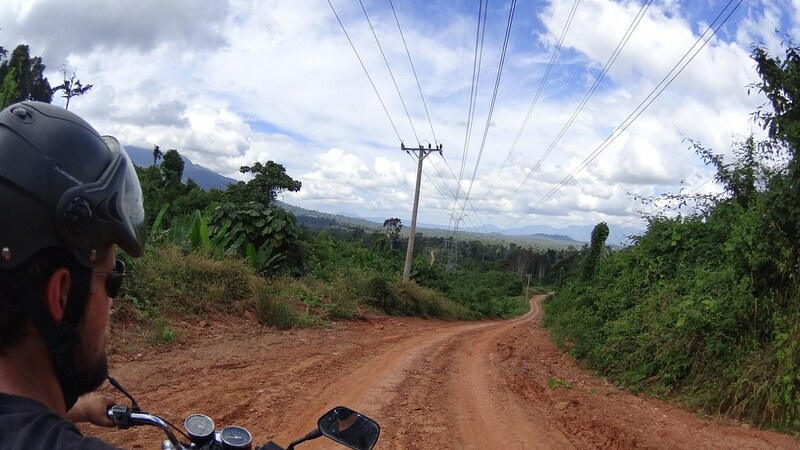 We left Otres Beach to continue our way in northern direction through the Cardamom Mountains, a route less travelled but extremely scenic, through the heart of the national park. 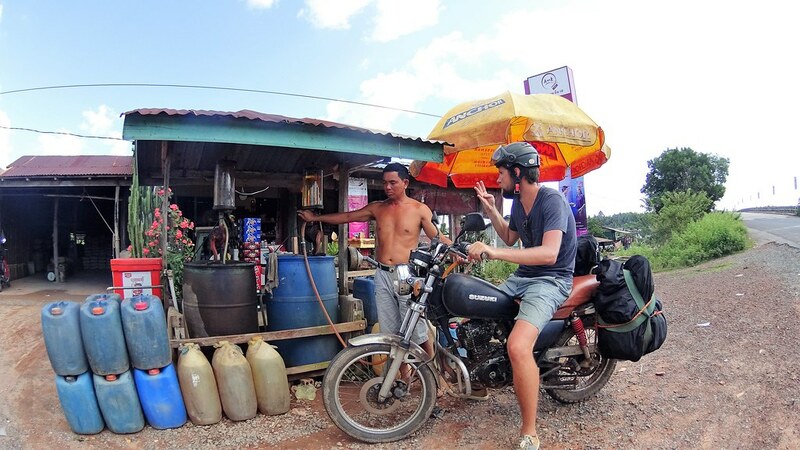 It was difficult to find information on this route (as the normal – longer but faster – way to reach Battambang or Siem Reap is going over Phnom Penh by using the regular highways), so we were in for an adventure! Our first destination was Chi Phat, Cambodia’s pioneer community for ecotourism. The first part of the road was quite easy, following an almost empty highway while enjoying beautiful landscapes. What seemed to be a bigger challenge, was finding beauty supplies along the way. We needed to pass 3 “villages” and visit 10 different “shops” in order to find tooth paste, mosquito spray & sunscreen. 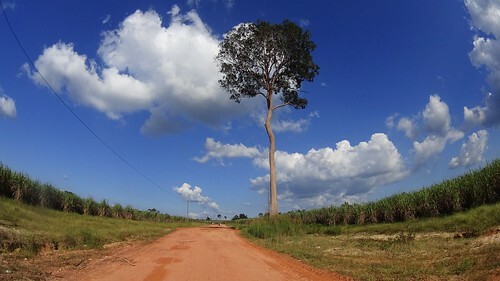 Sunscreen is very hard to find in remote villages. The best we could find was a “Whitening Cream”, but it had an SPF50 label, so it did the trick! And it also actually whitened our skin, like it had some talcum powder or something in it :-). The last 20km was an offroad path leading us to Chi Phat (compared to the road quality that we would encounter in a few days, this was actually a quite smooth road ). 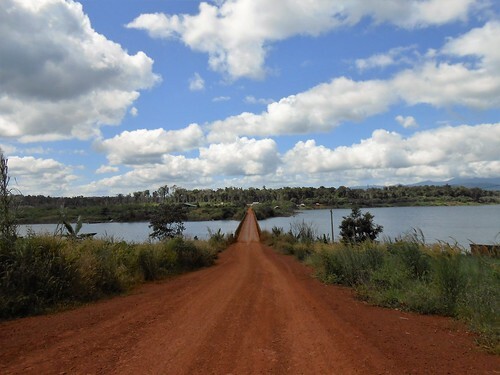 We loved this road, it was a feast for the eye, where the earth is red, the sky is blue and the grass/forest is green! 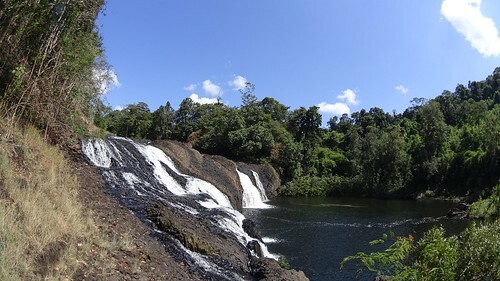 Next day we mountainbiked our way around Chi Phat and this was super cool: a small track through the forest – quite technical by times, that led us to a waterfall for a lunch & swim stop, before heading back along the typical scenic roads (red-blue-green ). 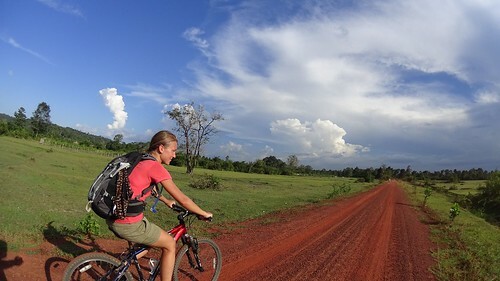 The day after, the plan was to continue our way through the Cardamom mountains, using a dirt road. The info we found on blogs, forums, … was that this road is in really bad condition & only doable during dry season. 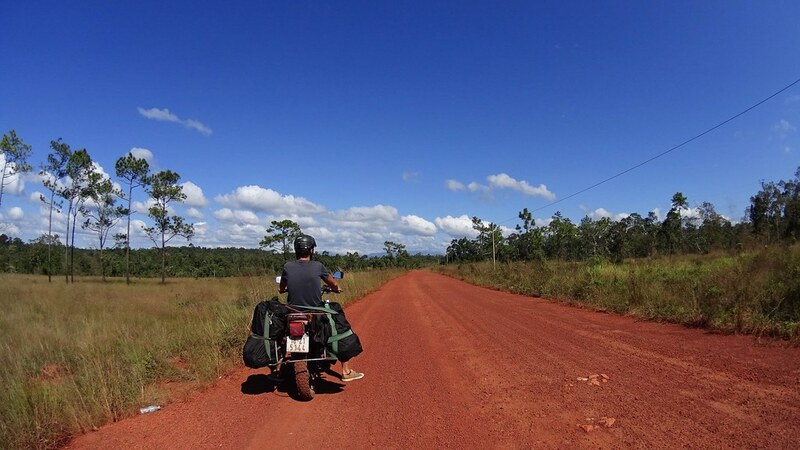 Lonely Planet says: “Roads are heavily rutted & bridges have holes big enough to swallow a car tyre”. 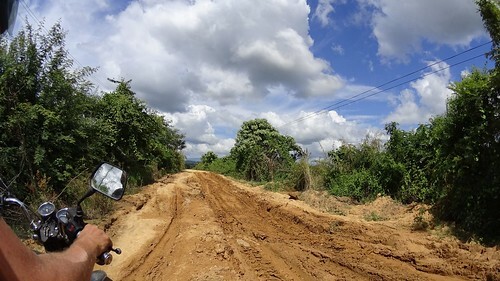 As we are on the end of the wet season we tried to further inform us about the current condition of the road, but this was not so easy. 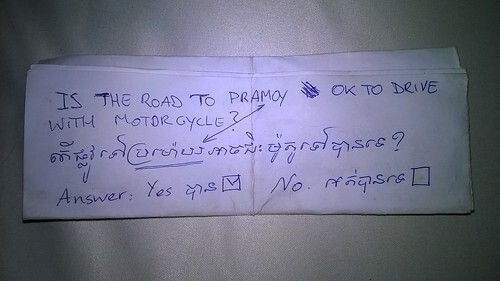 OR there was this language barrier that made it impossible to communicate with locals along the way (even with the question on paper – see picture below), OR there were people understanding what we were asking but saying “No” or “Phnom Penh” or “Very bad road” or “You should only go if you are with a group”. We really wanted to do this, so this is not what we wanted to hear. 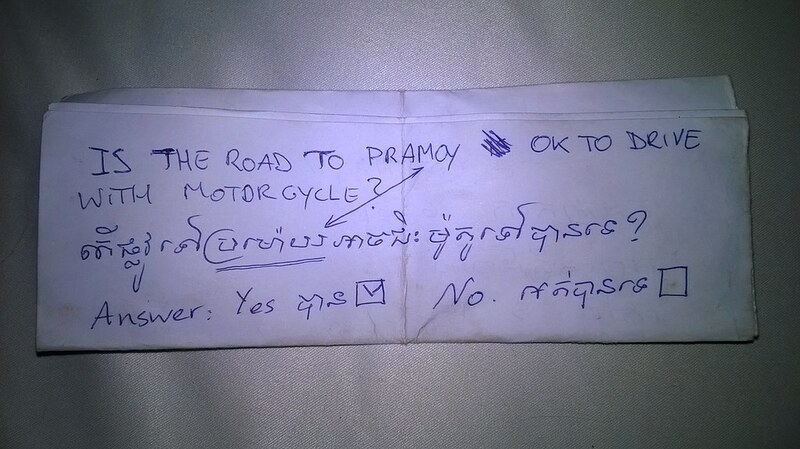 So finally we found an English speaking hotel manager that said: “Yes, you can go!” and this was all we needed to hear (even when this was just before he said: “I used to send hotel guests there, but not anymore as too many cars broke down). But we got ourselves a YES, so there was hope again! But then our motorcycle said NO, by squealing… louder and louder… and by losing a cap that closed the engine. We were still on the main road, so decided to first ride to the closest city Koh Kong for a check-up before trying to continue our way off road. Mechanic N°1 closed the engine with some silicone and changed the oil but clearly did not feel like looking where the noise came from. Mechanic N°2 did a better job: they stripped down the engine completely and checked every screw and bolt along the way. A 3 hour job by at least 2 workers for the ridiculous price of 13$ . Most importantly: the noise was gone, whiiiiiiii!!!!! So the morning after, with much hope, we left. We got ourselves a second YES btw (from another hotel manager, who did this trip once, about 3 years ago 😉 ). With 370km to cross, of which 220 via dirt roads, we had to split the journey in 2 days and we did this quite exceptional with a night in the jungle. 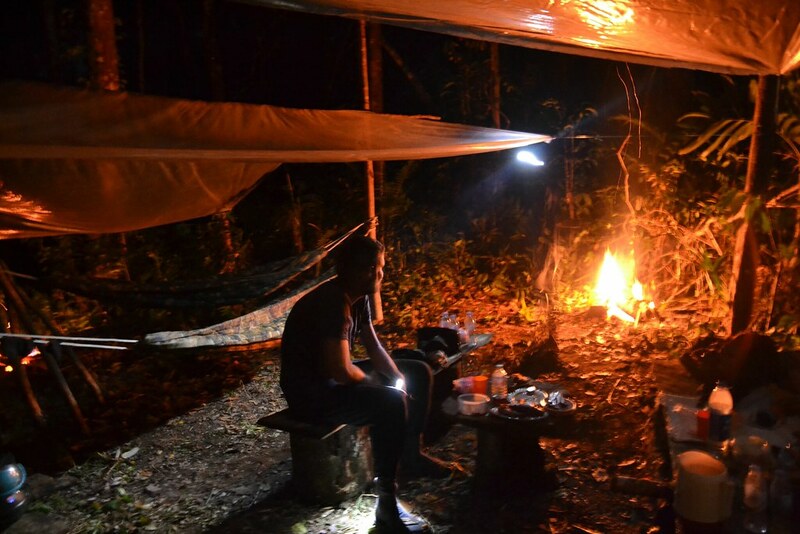 When the road condition on day 1 was surprisingly doable, the way to reach the jungle camp was totally not! They took us with the motorcycle & all our luggage on an abandoned (and hence overgrown) jungle path (again the result of a difficult communication with the guide). This “path” was crazy! Let the movie speak for itself. 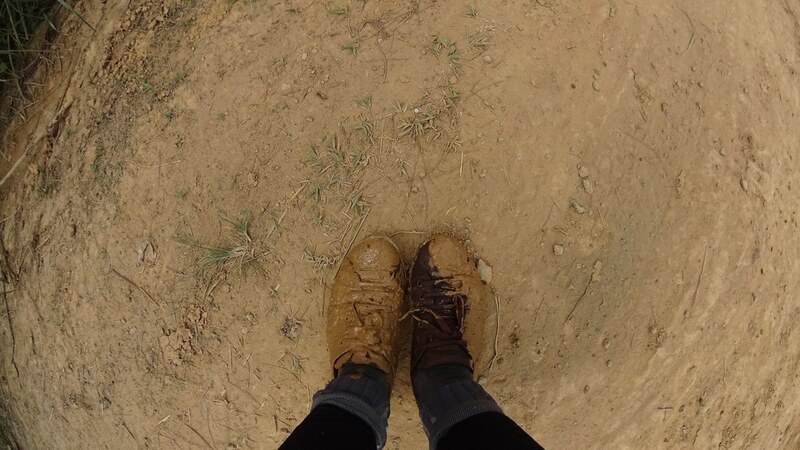 Note that this was however on the most “easy” part of the track, when there was no mud, no water pools and we were both on the motorcycle! The slipping parts are not on camera either, as it was getting a bit too serious . 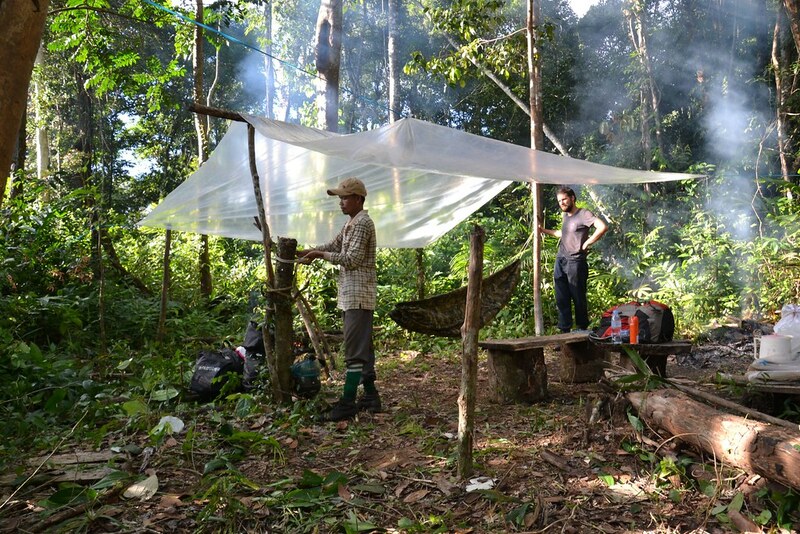 Out of nothing, the 2 guides set up an impressive jungle camp that involved jungle clearing with their machete, while we recovered from the ride (and tried not to think about the fact that we had to take the same way back the day after). 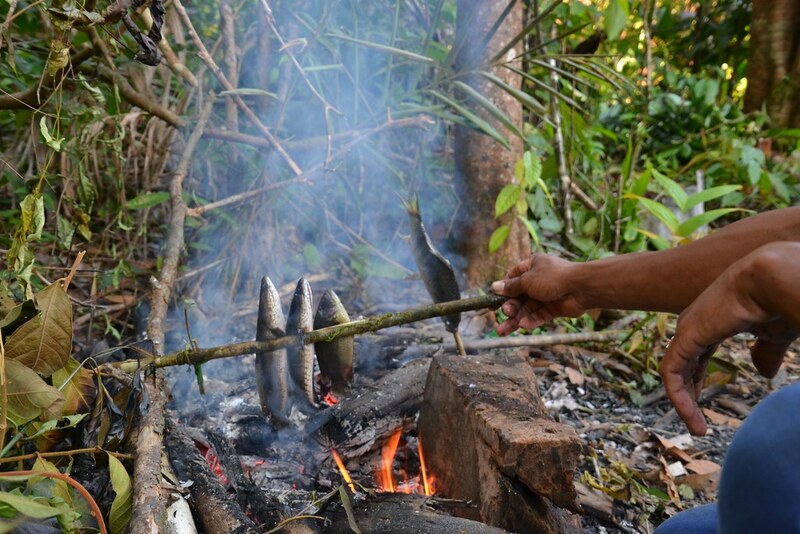 The Cardamom mountains are snake’s paradise. We encountered 3 in 1 day: one on the road (big one, but apparently also scared of us as it turned away very fast), one on a toilet door (medium one, but apparently big enough to scare the hell out of me) & one in our jungle camp (small one, but apparently very poisonous!). 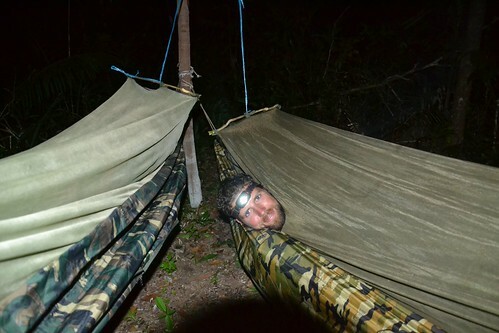 After a jungle sleep, a morning jungle hike & the jungle track back with the motorcycle – with as a result many tree scratches, 5 leech marks (Benjamin), dozens of mosquito bites of which 8 (!) 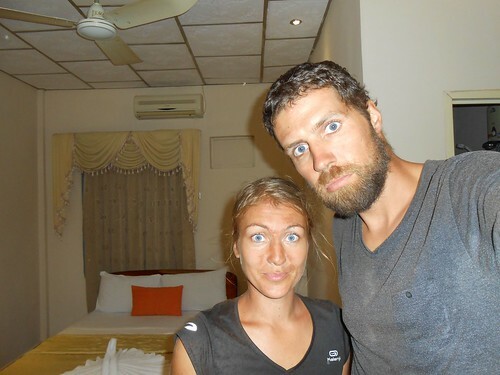 on the forehead (Céline) and wet muddy shoes (both)-, we were TOTALLY ready for 270km of dirt roads & busy highways! The road condition on day 2 was more like described in Lonely Planet. The amount of mud parts that we had to pass was quite ok, it was mainly the enormous amount of potholes & the dust that made it a very hard day. 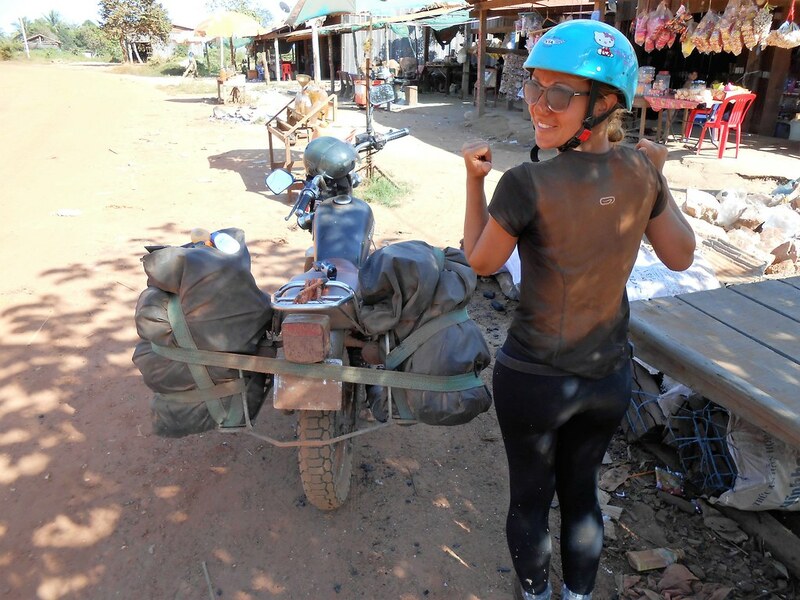 We were tired, broken & dirty when we arrived in Battambang. When Cambodian people start making signals that you should wash yourself, you know it’s time for a long long shower! 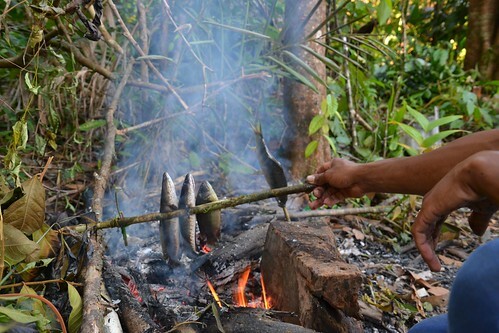 But we reached our destination and took the Cardamom mountains to reach it. We were satisfied! Yes we washed off our Mascara! Leuk dat je volgt! We hebben -zodra we terug in de ‘bewoonde’ wereld waren – terug gewone zonnecrème gekocht hoor 😉 Is idd maar raar spul, maar beter dan verbranden veronderstel ik! Veel plezier, ik vond het zaaaaaalig om achterop de brommer te zitten!